Add nighttime safety to your parking areas and roadways. Patented 360° domed reflectors provide day or night time visibility marking and safety light reflection from any direction. Delineate your parking lot, direct traffic flow, mark fire lanes and hydrants or handicap spots. Easy-to-pop-in Reflector SuperSpot® parking markers require no cement or glue to install. Maintenance free. Multiple color options. Stripe spaces or lanes, create arrows and customize your lot. Works with TRUEGRID PRO PLUS. TRUEGRID allows you to design maximum efficiency, safety, functionality and personality into your parking lot. Make a good first impression when people come to your place of business. 360° Degree omni-directional light reflection. Highly visible geometric dome design. Patented 360° degree reflection technology allows maximum visibility for drivers. Night time safety. Wet and dry reflectivity. Maintenance free striping or traffic flow markers. Parking delineation for maximum lot utilization. No more striping and restriping. 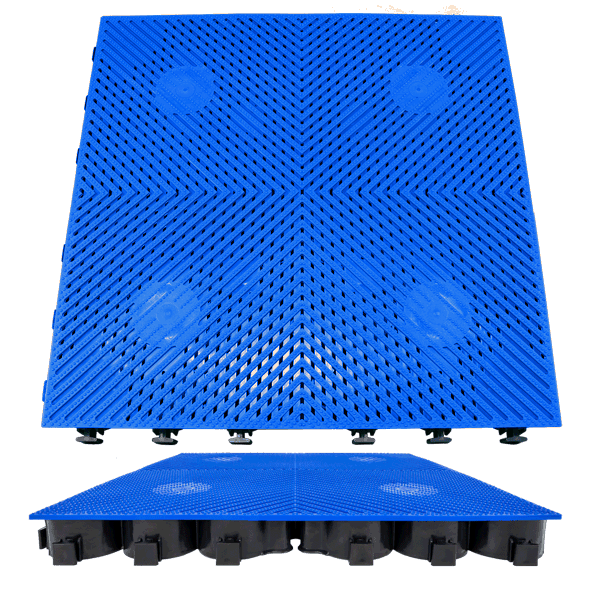 The patented omni-directional Reflector SuperSpot® provides an important safety feature to your permeable parking lot or roadway. The system utilizes a prismatic inner surface comprised of an array of mirrored polygonal shapes. The translucent top surface protects while enabling light to penetrate to the inner surface and reflect outwardly. The 360 degree reflective design allows headlight reflection from any direction providing maximum safety and visibility for night driving. Traditional striping requires regular maintenance and restriping. Fading reduces visibility. Not so with SuperSpots which are domed for visibility and color stabilized for long term weather resistance. TRUEGRID Pavers are known for their durability as are our SuperSpots. Easy to install, just pop them into the grid system and choose where to delineate parking spaces or traffic flow. Safely mark your parking spaces, fire lanes, handicap designated spaces, restricted parking areas or traffic flow arrows. 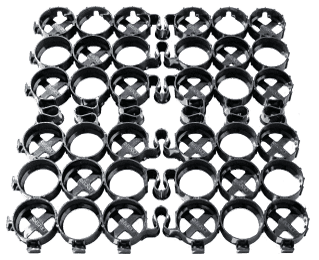 The only permeable paving system with patented 360° reflector technology. Reflector SuperSpots solve issues common with typical striping methods that tend to fade over time. Long-lasting and durable, SuperSpots are maintenance-free and are easy to install. Just pop one in into the TRUEGRID PRO PLUS grid and create custom shapes and delineation. Easy to install, high visibility SuperSpots®. Mark parking spaces, delineate driving lanes, and create custom shapes with high visibility SuperSpots®. This car dealership needed a solution. Build a parking lot but stay in budget. The cost to build a concrete parking lot proved to be expensive, especially with the required detention pond needed to pass city regulations due to impervious cover. Find out how this dealership found a solution. Click the icon to download direct, or send us your email and we will deliver the files straight to your inbox. This option is great if your organization does not allow direct downloads to individual computers.